The Berlenga Island can be visited all year. The regular passengers transport service “Cabo Avelar Pessoa” is only available during the summer season (May 20 to September 15) but there are many maritime-tourist boats that carry out trips in every month of the year. See the list of licensed operators and their contact details. The Berlenga Island has a curious shape forming an eight. The “carreiro dos Cações” and “carreiro do Mosteiro” almost split the Berlenga Island in two parts, the Ilha Velha (Old Island) and Berlenga. There is one trail in each side of the Island. It is forbidden to walk outside these marked trails in order to protect the native fragile vegetation. Berlengas are home to the only pelagic seabird colonies in Portugal mainland. There are six species of seabirds breeding in the Berlengas: Cory’s shearwater, Band-rumped Storm-petrel, European Shag, Yellow-legged Gull, Lesser Black-backed Gull and Common Murre. 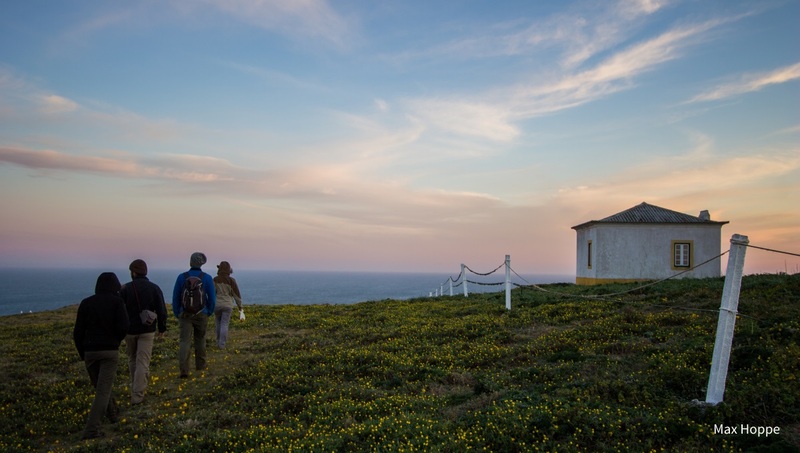 The Berlenga Island can be an interesting place to visit during the post-nuptial migration (from September to November), as some migratory birds seek refuge on the island and can be easily detected as there is no trees or dense vegetation. The lighthouse plateau, the cliffs protected from prevailing winds and the Fig Tree located in the beach are some of the best places to search for migrants. During this time of the year, Berlengas are like a surprise box where almost any long migrant can be found. Rarities such as the Pacific Golden Plover, Richard’s pipit, Yellow-browed warbler or Lapland longspur have already been found there. Black redstarts, Peregrine falcons and Kestrels are resident species in the Berlenga Island. As a result of its complex geology, Berlengas has a number of bays, caves, islets and small rocks. The natural beauty of Berlengas is worthily to visit from sea as there are many beautiful and scenic geological formations all around the island, like Furado Grande Cave, Cova do Sono Bay, the Elephant trunk Arch, the Quebrada valley, the Cações Path or the Damn Cliff. Watching cetaceans in the wild is a relatively rare privilege. To see dolphins playing and jumping in the waves produced by our boat is a unique spectacle! There are several species of cetaceans occurring in the waters of Berlengas Special Protection Area (SPA), as the Bottlenose dolphin or the Pilot whale, however, Common dolphin is the most common species. In Peniche there are several tour operators that offer dolphin watching trips. Recreational scuba diving is probably the most popular activity for the tourists visiting Berlengas. With a unique marine ecosystem, probably the richest of Portuguese waters, the Berlengas sea allows fantastic dives full of underwater life. Here you can see large shoals of multiple seabream species, conger and mackerels, walls covered with gorgonians and impressive Ocean sunfishes or Dusky grouper. There are several diving spots in the archipelago, from Berlenga Island to Estelas Islets and Farilhões, some of which have old wrecks vibrant of marine life. There are several diving schools offering diving trips to Berlengas. For non-divers, snorkeling allows admiring a little of the underwater life of Berlengas. From the beach of the Monastery path you can see a number of fish species such as seabreams and Grey triggerfish. For the more adventurous, kayak and stand-up paddle are rewarding ways to visit the waters around Berlenga Island and observe the natural beauty of its cliffs, rocks and caves. These sports are offered by several tour operators from Peniche and require authorization by the Berlengas Nature Reserve. During the summer season you can also rent a kayak on the Island.